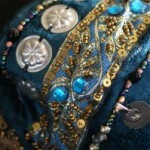 This was my first bra project, and also my first ever belly dance costume piece, but in my usual convoluted way. ends being posted here after others. Most of the basics of how the bra cups were setup have been explained in the original how to cover a bra post. The only major difference in the cups is that I used the exact same pattern for all three new layers on the cups: interfacing, calico and fashion fabric, to keep the cups as smooth and even as I could. 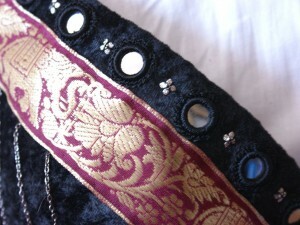 I chose crushed velvet as fashion fabric. After reinforcing the cups, I obtained a pattern from the stretched band, made two mirrored versions of it in calico, edged each with gross-grain ribbon (again, for extra strength and resistance to stretching) and covered them in the crushed velvet. I then anchored the straps, created as stated before, crossed over the back, to each of the “peaks” in these new pieces. I left the standard bra band in place, now with the insertion points for the old straps attached to the anchoring points for the new ones, and added hook and eyes on both ends of these new rigid pieces, so they interlock and flatten. The bra is then supported in place by the crossed straps, the original bra band and the new calico semi-rigid band, which not only supports any wayward “extra” flesh that wanted to move out of place, but also makes this incredibly strong: once you put it on, it WILL STAY THERE! 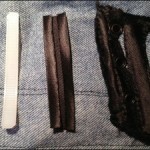 And since the old bra band is sewn to the old one, it won’t curl and show underneath or above the fashion fabric one. All I thought was left after that was adding decoration. 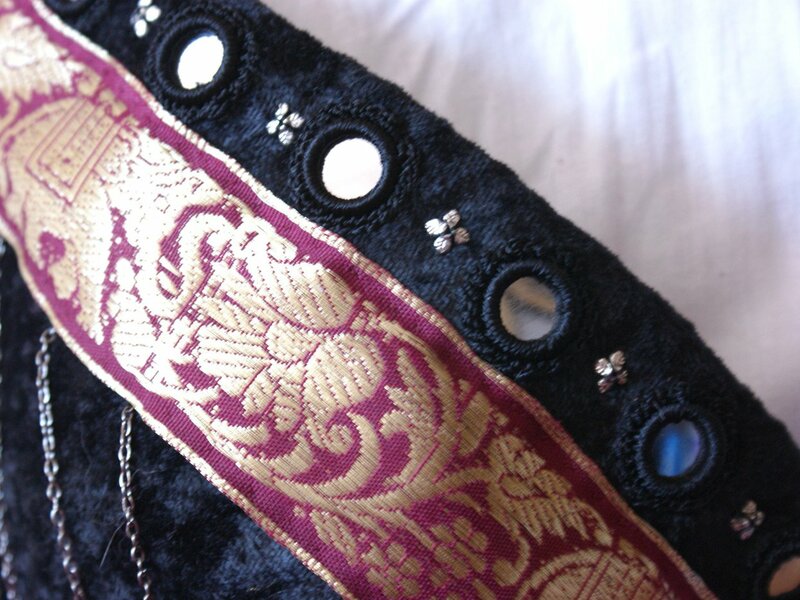 For this I chose a gold and burgundy jacquard sari ribbon, shisha mirrors and some silver-plated flower findings that I had leftover from a jewellery project, which turned out to look really nice when sewn onto the black velvet. I used a fine needle and extra strong thread to avoid problems. I finished it all off with four sets of chains to add some movement around the cups, and a kuchi piece with dangling chains that adds a bit more interest and movement. Sadly, as this was my first ever piece of costume, I learnt a LOT: I learned that you cannot push a needle through foam cups and 3 layers of fabric plus adornments without damaging your nails very badly, for instance, but it wasn’t until I’d done the 3rd bra project that I finally found suitable tools, so for quite a long while after this, and the black costume, I had to wear my nails very short. This one also started the current trend with my costumes, which state that a costume isn’t finished until I’ve somehow managed to make myself bleed. And boy did I bled *sobs*. Later on, after thinking I’d finished and worked on the piece overlaying the bra, I also added an extra piece in between the cups, as I decided I wanted a smoother line under the cups. And soon I will change the hooks and eyes for hooks and slides, which are far easier to take on or off, and stronger. The other interesting thing of note for this whole costume is that absolutely everything, except for the calico fabric used for support, was purchased online, most of it via Ebay. 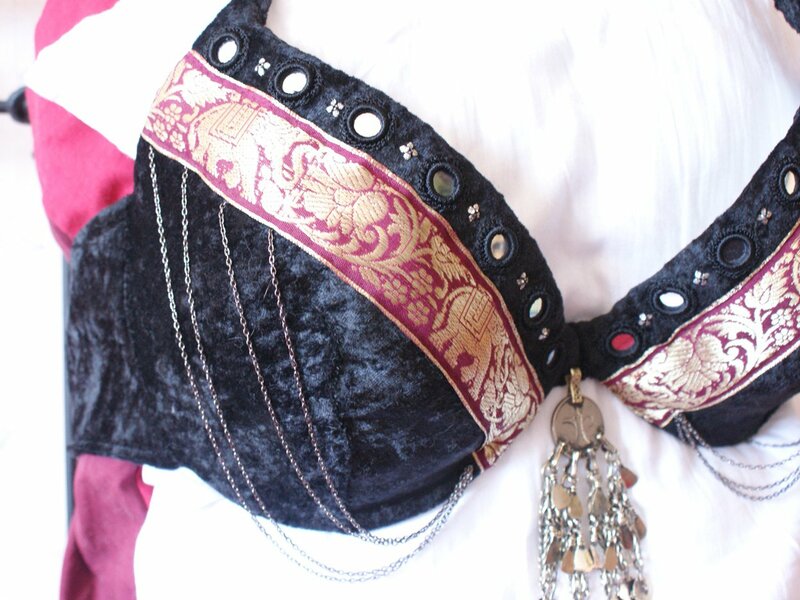 The bra was part of a dual-pack from Naturally close (the second bra went into the black and silver Fustan Raqs), the kuchi piece came from Sirik Tribal, the fashion fabric and jacquard came from Cheap Fabrics UK, and the rest of the decorations were obtained via Ebay. Nowadays I would re-think the position or even use of the chains. The method does work well, however, and the result was quite a nice bra that supports and enhances my bust very naturally. Possible variations include removing the bra band altogether and changing it for the ever popular rings with ribbons tied through them, or even possibly leaving the rigid side bands up to a certain point (maybe one third of the back) then add the rings there. 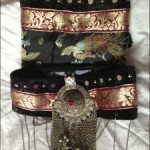 This particular bra was created for a ghawazee/bra/belt ensemble or gypsy top/bra/belt (as shown in the Tribal Outfit post), so the back needed to be very flat to avoid showing too much through the top layer. I’m also very tempted to replace the central kuchi piece with a similar piece with burgundy and black enamel, and longer chains, and rearranging the chains to drape along the bottom instead of dragging downwards, but this is something that I will have to re-think at the time I re-think the chains on the matching belt (upcoming making-of post, really!). New Teal Bra, part 1; lots of photos!